Here’s what happened in last night’s game. Each PC earns 1,140 xp, so you should all make 13th level next session. The PCs talk to the four eladrin they rescued from the drow and trolls in the ruins of Orrak. There is a bit of chemistry between Simlathril of Celduilon and Gilgarran – could this be the start of a new romance? Meanwhile, Juma Ji’ad’s skin appears to be turning transparent as a result of the alien fluids he got splashed with in the Great Warren. It’s getting dark so the party camp here for the night. The party set off for Moonstair. En route, Ulthar notices the drow armour he is carrying appears to be smouldering in the sunlight, so he wraps it up to protect it. Juma’s condition seems to be getting worse and there is nothing the others can do to help. He needs someone to cast a remove affliction ritual on him – hopefully the clerics in the temple can oblige. Late in the afternoon, the PCs reach the farmsteads outside Moonstair. Most have been set aflame by the invading troll army – the corpses of farmers, town guards and eladrin archers lie in the burned fields. Heading through the smoke, the party come across a farmhouse that’s still standing with a woman and man staring out of their window in terror as a troll and pack of worgs close in. The Juma Gang charge to the rescue – Ulthar uses Glasbaeter to extinguish the flames outside the window so the farm folk can jump out, as Hrothgar and the others attack the worgs, aided by the four eladrin archers. Meanwhile the troll worgmaster has smashed his way into the building and it soon becomes obvious that there is a little girl trapped inside too. The two farmers leap out of the window but unfortunately the woman is eviscerated immediately by the jaws of a waiting worg. The man makes a run for it but is brought down and killed, although the piglet he had tucked under his arm manages to get away. Then, the troll comes out of the building with the little girl. Luckily, she wriggles from his grasp and scarpers after Ulthar and Juma arrive to keep the hulking brute occupied. Gil helps out by using casting his incendiary detonation spell on the troll and its worg ally, but upsets Ulthar by knocking him prone in yet another friendly wizard fire incident. Meanwhile, Sora and Bax fight side by side to finish off the other worgs. Finally, Juma’s much-maligned dwarf wall of fire burns the troll to death after his regeneration brings him back round again from unconsciousness. Perhaps the spell isn’t so bad after all! The little girl, Gehira, has run into the arms of Berig, a nervous, young guardsman who explains that the town is under attack on two fronts – the Old Troll Wall and the waterfront. 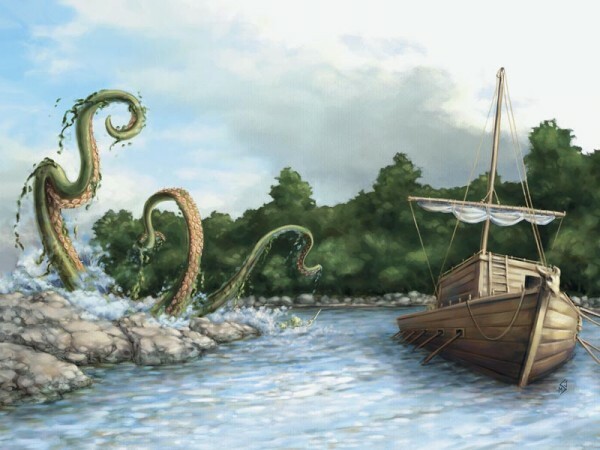 The PCs hurry with him to the boat landing where two guards are manning a ballista in the face of kuo-toa, chuuls and a tentacled monstrosity, all attacking from the waters of the river. Hrothgar charges the kuo-toa on the jetty, and “Captain” Juma runs to man the ballista after Berig and one of the other guardsmen are snatched by tentacles and dropped in front of the hungry chuuls. Gil can’t keep out of range either, despite casting spells from a long way back on the shore, and Sora is grabbed too but strikes back, destroying a tentacle. Juma soon gets bored firing ballista bolts at the chuuls and goes to help Hrothgar and Ulthar on the jetty against the kuo-toa and one of the chuuls. The fish-men employ sticky shields which ensnare the PCs’ weapons, pulling them out of their hands. After a few rounds, the PCs down the kuo-toa and one chuul. The one surviving guardsman, Alaric, kills the last chuul, firing the ballista single-handed. Sora and Gil attack the muck the tentacles have sprung from and this seems to work – the remaining appendages disappear under the water. Before the PCs have much chance to catch their breath, another guardsman appears. The PCs are needed to help defend the Old Troll Wall from an aerial attack!